In order to meet customer needs quickly and flexibly while consistently offering quality products, we aim to continually modernize and produce an intelligent product line based on a comprehensive online management system. Along with the introduction of the most advanced machines and test instruments, which are capable of measuring to the highest precision, we are constantly refining our manufacturing system. With a combination of many high performance machines and robots, we have achieved remarkable advances throughout the entire production process. This systematic and integrated production line has made remarkable progress in providing better working conditions that reduce the burden on workers. As part of our research and development facilities, we have an electromagnetic shielded room and a cold chamber (capable of maintaining -45 deg. C). We are also making full use of a variety of testing equipment such as alignment testers, brake testers, rollover testers, weight scale, and vibration exciter. We have a test-driving course for crane carrier, along with gradeability test courses (with 15 and 30 degree inclines) and a rough-and-rugged surface test course for excavators. These courses are used to carry out performance tests on our equipment under the most severe conditions. For product inspections, we have introduced high-tech equipment, such as an ultrasonic deep defect tester as part of our absolute quality assurance program. Especially for hydraulic equipment, we perform critical tests using the most advanced testing instruments. In addition, we use fatigue test equipment and other equipment to provide stringent test environments. We have introduced equipment such as NC machines, welding robots, automated welding machines, and plasma cutters to achieve the highest level of precision in the manufacturing process. Medium- and large-size rough terrain cranes, all terrain cranes, etc. 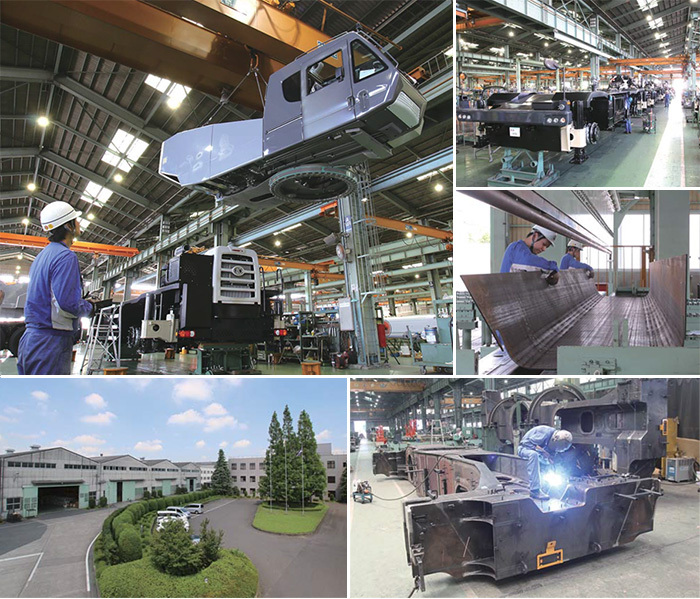 For this dedicated mobile crane plant, we have built a system with a rational layout that can produce many different models efficiently, from manufacture of large welded structures to assembly of the chassis. The plant meets the needs of this era of diversification and provides high-quality, and high-performance products. Hydraulic excavators, earth boring rigs, street sweepers, vacuum trucks, Small-size rough terrain cranes, truck cranes,etc. This plant represents our company's technology, by making full use of the state-of-the-art equipment to manufacture our catalog of products with an integrated production system. 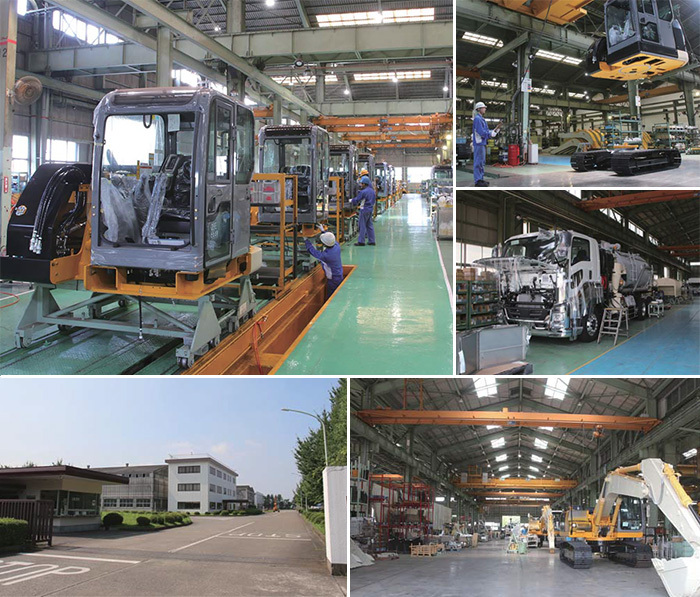 In addition, the plant is equipped with a R&D test yard for hydraulic excavators and a comprehensive test course for mobile crane chassis that make effective use of the vast site area and enable us to improve our product durability and reliability. ©2016 KATO WORKS CO., LTD. ALL RIGHTS RESERVED.